Welcome to Energy Equals Wellness, LLC! Linda advocates for a natural and holistic approach to whole-body wellness. After 19 plus years working in the alternative health care field, Linda established Energy Equals Wellness, LLC. We—our bodies—are made of energy, and so Linda’s first focus is on building energy through proper nutrition. A customized nutrition analysis identifies the nutrients your body needs to attain and maintain wellness. 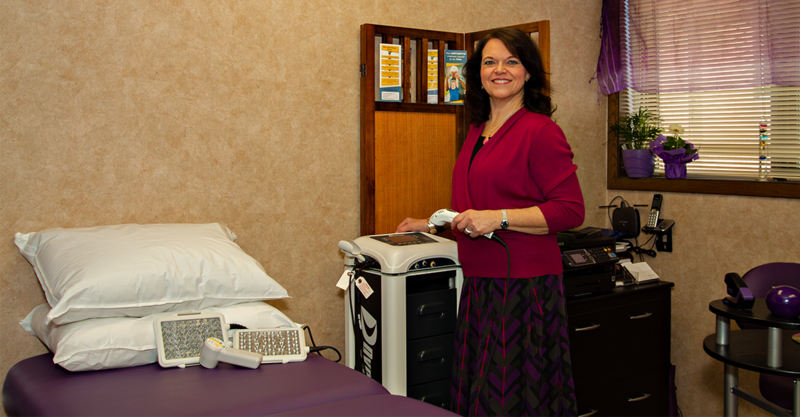 As a cold laser / low-level light specialist, Linda uses the energy of laser applications to promote a return to wellness throughout the body. Low Level Light Therapy (LLLT) encourages tissue repair, pain reduction, and accelerates the resolution of inflammation. When our bodies are hurting, the energy of LLLT can aid in a return to wellness. When it comes to wellness, all energy is not healthy energy. Research now links long-term exposure to electromagnetic fields (EMFs) with many chronic health issues. Linda will help identify, and show you ways to protect yourself from EMF sources that may be affecting your wellness. Energy Equals Wellness, LLC : A natural, holistic approach to wellness! Energy Equals Wellness… Wellness Equals Energy! Unless otherwise noted, any statements made have not been evaluated by the Food and Drug Administration. Any product or service sold is not intended to diagnose, treat, cure or prevent any disease. Nutrition and wellness information provided by Energy Equals Wellness, LLC, or any vendor represented herein, is intended for the reader’s general knowledge. In no way should this information be taken as a substitute for professional advice, or treatment for a specific medical condition. Always seek the advice of your physician or qualified health care provider with any questions you have regarding any medical condition. The information herein is not intended to diagnose, treat, cure or prevent any disease, nor do we make or intend to infer any such claims. All orders placed with Energy Equals Wellness, LLC are subject to acceptance at our sole discretion. Should we deem it necessary to cancel an order, it is done so without liability beyond a refund of any funds received from the purchaser.